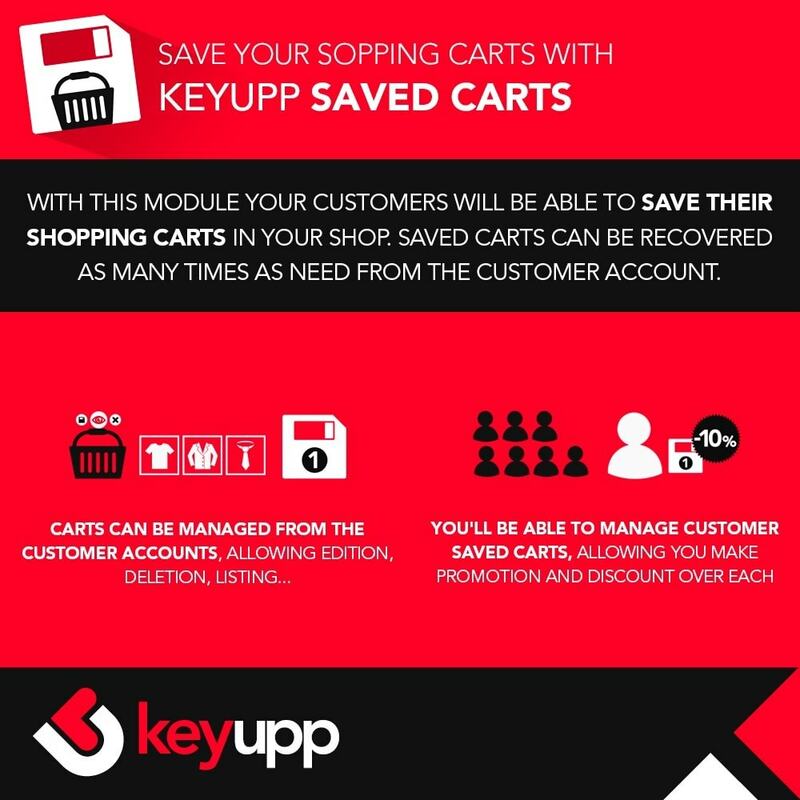 · Allow your customers to save their shopping carts and recover them everytime they need. 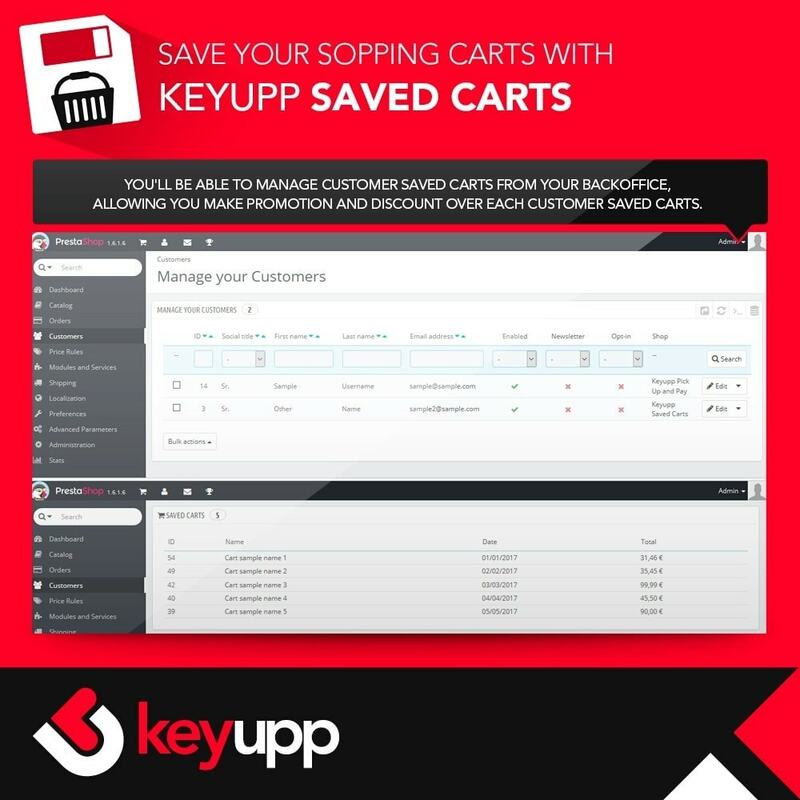 · You'll be able to manage customer saved carts from your backoffice, allowing you make promotion and discount over each customer saved carts. 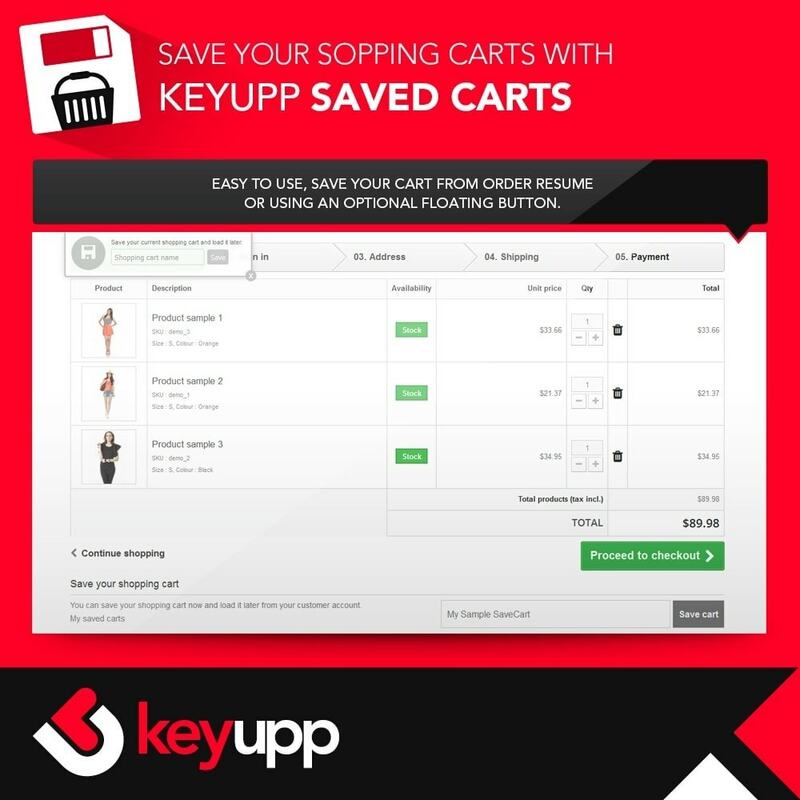 · Increase your recurrent orders in your shop making the process easier thanks to your saved carts module. · Your customers will have just to load a saved cart and place a new order. · Your customers will never lost a cart again, they'll allways be able to save their cart and place their orders later. 1. Easy to use, save your cart from order resume or using an optional floating button. 2. Just type a name for your cart and save it. 3. Saved carts management form customer accounts. 4. 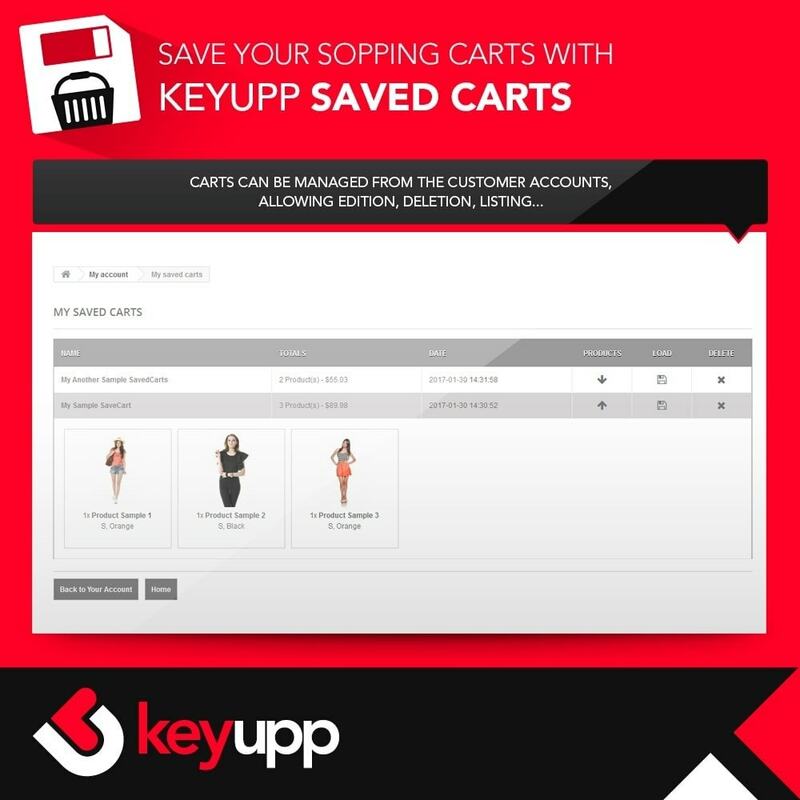 Administrator can manage customer saved carts from the backoffice. 5. 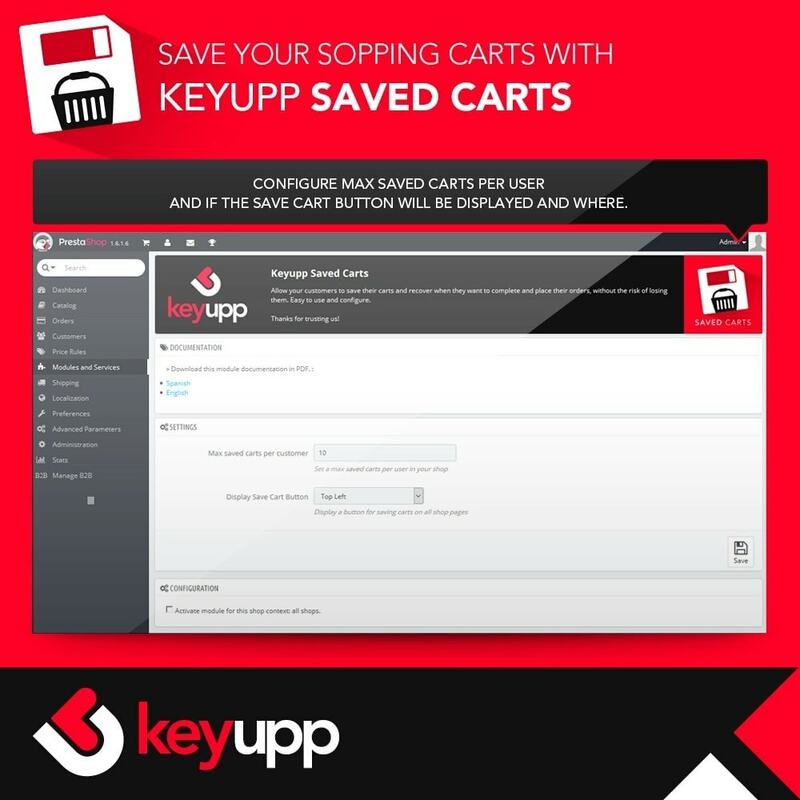 You can configure the max saved carts per user. 6. You can configure to hide or show the save caert button and its position in your shop. -Once the module is installed, you will have access to the module configuration via the Modules and Services section in your backoffice. -In order to save a cart, just type a name for it and click on "Save" in the cart resume page or in the floating optional button. · Your customers will be able to save their shopping carts and load them everytime they need. · Each saved cart can be loaded as many time as need. · A customer can load a cart and place an order with ir as many time as he need. Perfect for recurrent orders. · Carts can be saved from the order resume page or by using an optional button allways visible in your shop pages. You can install this module from the Modules tab in your shop (Backoffice > Modules and services > Add new module). Simply upload the package you have previously downloaded from the Prestahop addons. In some cases, usually due to hosting restrictions, it is not possible to upload the package from the Prestashop backoffice. In these cases you may use a FTP client to upload the module folder to the modules folder in your shop. Once the module has been uploaded, it will show in the list of available modules for installation and you’ll be able to install it in your shop.